RT8487 is a boundary mode constant current controller with internal high side driver, which can be used in buck and buck-boost configuration, to provide a constant output current to the (LED) load. It contains special circuitry for achieving high power factor and low input current THD, while minimizing external component count. The small SOT23-6 package keeps application footprint small, and makes RT8487 a cost effective solution for off-line LED drivers. 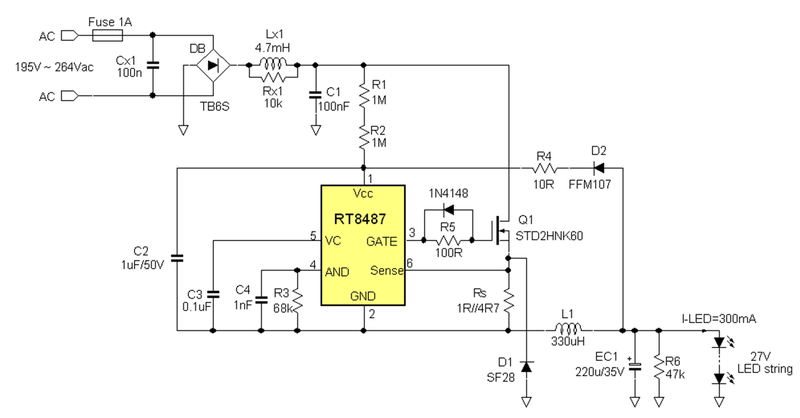 This application note provides details on how to design a cost effective 8W Buck LED driver with RT8487. Important requirements for low cost off-line LED drivers are high efficiency, good Power Factor with low THDi fulfilling IEC61000 class C, accurate LED current, fast start-up, and simple design using low cost standard components. The following 8W LED driver design with RT8487 in floating buck configuration fulfills all of the above. Full protections: output short-circuit, LED open circuit, over current and over temperature protection. Key focus on low BOM cost by using transformer-free design with standard low cost components. The total application of the 8W LED driver is shown below. RT8487 is used in floating controller buck configuration. The complete application circuit is shown in figure 1. The IC controls the switch-on time of the high side MOSFET Q1, and it senses the average LED current via RS which is in series with the buck inductor for true load current sense. Boundary conduction mode switching is obtained by sensing the zero inductor current (also via RS). High efficient resonant switching at minimum drain-source voltage is achieved by programmable switch-on delay from zero current detection point (via R3). A smart algorithm controls the ON time to obtain high input power factor and low THDi. IC bias is provided by a simple bootstrap circuit D2 & C2, thereby eliminating the need for a separate auxiliary winding. This makes it possible to use a simple standard drum coil instead of a more expensive custom wound transformer. Low IC start-up bias current allows the use of high value start-up resistors R1 & R2 while still achieving fast start-up (typically 123msec). The total circuit can be built on a small single-sided PCB measuring 18 x 36mm. The following sections explain the settings of the various application parameters. The start-up resistors (R1+R2) should be chosen such that the current flow through these resistors at minimum line voltage exceeds the IC start-up current. Otherwise, the RT8487 Vcc may never reach the start-up voltage. The typical IC start-up current is 25μA. Start-up resistor should be chosen not to exceed the operating current. Otherwise, the VCC voltage may rise higher than set by the Vcc bootstrap circuit, and could trigger OVP. 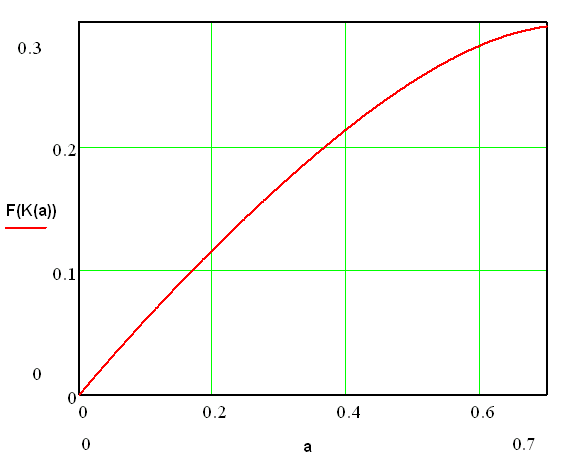 The typical operating current is 1mA. For most applications, C2 can be chosen 1μF. Figure 2 shows the IC start-up waveforms at 230V ac input. When AC mains is applied, the current through R1 and R2 will charge C2. 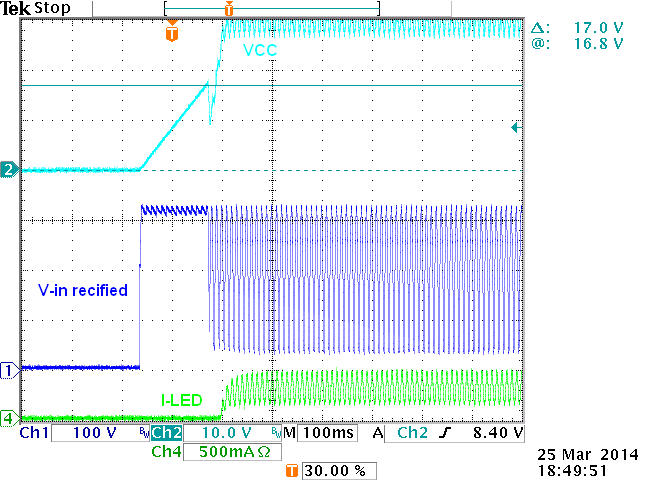 When the IC VCC voltage exceeds the UVLO level, the power MOSFET starts switching, quickly charging the output. Total measured start-up time was 150msec. For High Power Factor application, the input capacitor C1 should be sufficiently small to achieve rectified line voltage sine-wave. The voltage rating of the input filter capacitor, VCIN, should be large enough to handle the maximum input voltage. A 100nF / 500V film capacitor is a suitable choice. For reducing differential mode EMI, a pi filter can be used by means of two 47nF capacitors and a suitable inductor. Due to Boundary Conduction Mode switching, the buck inductance value will influence the converter switching frequency. For smaller size coil, a small inductance value could be selected, but the limitations are set by the IC minimum ON time (0.5μsec typically) and minimum OFF time (0.5μsec typically). The maximum inductance value is limited by the IC maximum ON time (15μsec typically) and maximum OFF time (33μsec typically). L1 was chosen 330μH with current rating 1.2A to achieve best compromise between size, cost and efficiency. After the inductor current has reached zero, a resonance will occur between the inductor and the total capacitance at the switch node, which is mainly determined by the MOSFET drain-source capacitance. In order to minimize the MOSFET switching losses, RT8487 provides the flexibility to adjust the delay time of next switch-on cycle in order to switch-on at the maximum point of the resonance, which corresponds to the minimum drain-source voltage value. 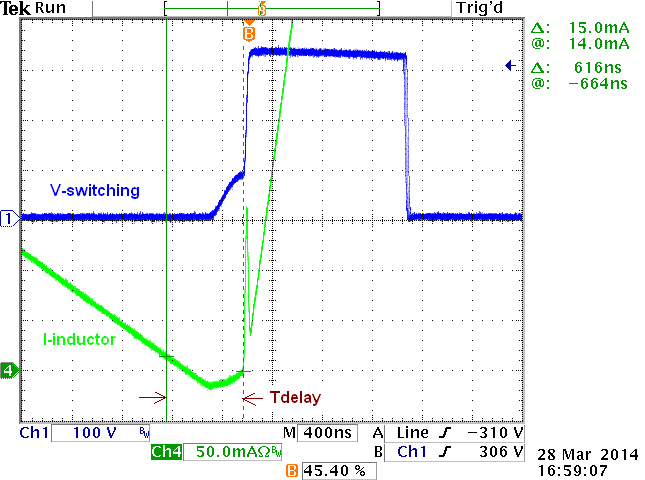 The total required delay time for optimal resonant switching needs to be chosen a bit larger to include zero current detection delay (around 290nsec in this case). So total delay time becomes 290nsec + 352nsec = 642nsec. The final value for R3 was set at 68kΩ. Figure 5 below shows the switching waveform with optimal resonant switch-on point. The MOSFET voltage rating should be sufficient to handle the max line input voltage peak value + margin for line transients. A MOSFET with minimum 500V drain-source rating is recommended. The MOSFET current rating depends on thermal aspects. A 2A MOSFET was selected for low dissipation and better efficiency. When the power MOSFET turns off, the path for the current is through the diode connected between the switch output and ground. This forward biased diode must have low forward voltage drop and fast recovery times. The reverse voltage rating of the diode is should be greater than the maximum input peak voltage + margin and the current rating should be greater than the inductor peak current. A fast 600V / 2A diode was selected for low dissipation and better efficiency. To achieve high power factor and low THDi, the inductor current contains considerable low frequency ripple. The output capacitor will filter the switching and low frequency ripple current to deliver a low ripple voltage to the LED string. The amount of output ripple voltage together with the differential resistance of the LED string will determine the ripple current through the LEDs. In this low cost design, a 220μF capacitor was chosen, which gives around 330mApp ripple current through the LED string. To reduce this ripple, a larger value output capacitor is required. Figure 6 shows the input and output voltage and current waveforms. Input AC waveform shows good PFC and low THD. The average output LED current is accurately set at 299mA. Figure 7 below shows the switching waveforms. To achieve low THDi, the current peak value is around 4x higher than the average current. 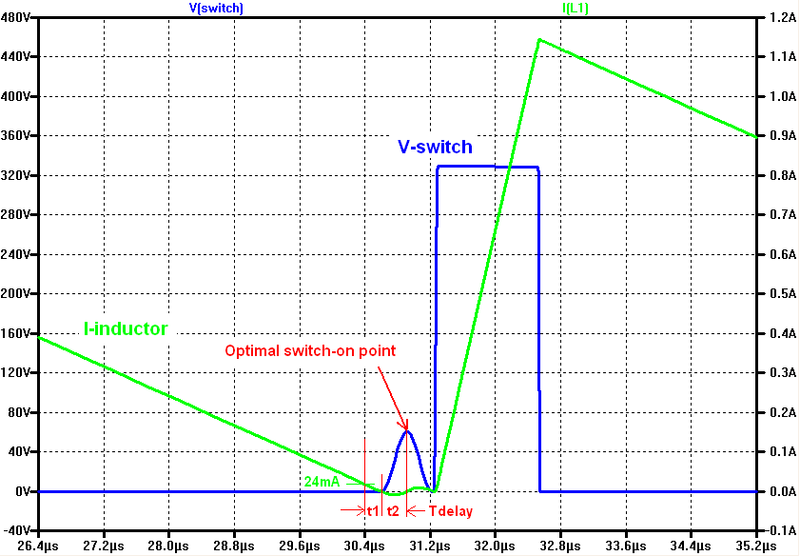 The single switching cycle shows fully BCM switching with minimum drain-source voltage switch-on. Below table shows the key performance parameters. Typical efficiency is 86% with excellent LED current stability over mains voltage and low THD fulfilling IEC61000 class C.
The 8W LED driver application is build on a small single sided PCB. Due to the floating controller topology, the components around the IC should be compact and close to the IC, and the layout should provide sufficient creepage and clearance margin for the high voltage swing. It should be noted that this layout is a preliminary version, and needs some further fine tuning to optimize performance: The buck inductor orientation with respect to EMI coil needs some modification: currently the stray field of L1 couples into LX1 and causes higher EMI readings. RT8487 makes it possible to design a very cost effective 8W LED driver which has good performance and meets the requirements of today’s LED driver market.